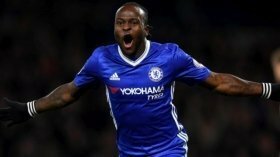 Victor Moses on brink of Chelsea exit? Chelsea winger Victor Moses is reportedly on the brink of joining Turkish giants Fenerbahce on loan for the rest of the ongoing campaign. Moses has spent the last six-and-a-half seasons with the Blues, but he has been barely utilised since Maurizio Sarri took over at the helm in the summer. That has resulted in the Nigerian being transfer-listed at the midpoint of the season and Goal.com claims that he is on the cusp of securing a move to Istanbul with Fenerbahce. The Blues were initially keen on the permanent sale of Moses amid interest from a few Chinese Super League clubs but they have eventually accepted Fener's loan approach for the attacker. Moses had been a regular feature under ex-boss Antonio Conte in the right wing-back role but the change of management has not favoured him with Sarri opting for the traditional four-man backline. Since the start of the season, Moses has generally been viewed as a winger by Sarri rather than a defender and this has restricted him to just two bench appearances in the Premier League.